The Redbone Coonhound is a treeing dog, meaning it was developed to track it's prey and then force the animal into a tree. Once it is treed the dog will continue to bark or bay until the hunter makes the kill or the dog is called off. The Redbone Coonhound is adept at tackling a wide range of prey aside from the raccoon, including puma and bear. 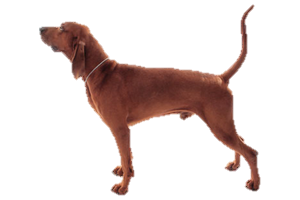 The Redbone Coonhound is developed from the same European hound stock as the other coonhounds. Although coonhounds have existed for sometime, serious breeding for the solid red coat did not begin until the 1920s. These early dogs were often called "saddleback" due to them often having a saddle patch on their backs, which gradually was eliminated. It may be that the source of their name comes from an early fancier and breeder by the name of Peter Redbone, while others contest it is simply a nod towards their coat. Is the Redbone Coonhound Right for You?